WINDSOR – Brian Masse M.P. 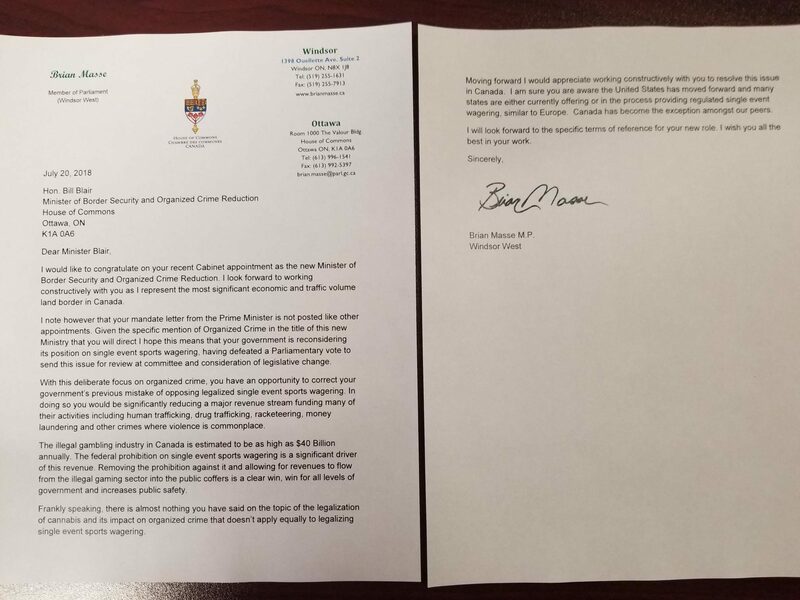 (Windsor West) has written the newly appointed Minister of Border Security and Organized Crime Reduction, the Honourable Bill Blair suggesting he work to reverse the Trudeau government’s mistake in opposing single event sports wagering. In his letter Masse points out that legalizing single event sports wagering could have significant and immediate impacts reducing revenues for organized crime: “With this deliberate focus on organized crime, you have an opportunity to correct your government’s previous mistake of opposing legalized single event sports wagering. In doing so you would be significantly reducing a major revenue stream funding many of their activities including human trafficking, drug trafficking, racketeering, money laundering and other crimes where violence is commonplace.” Masse wrote. The recent Supreme Court decision in the United removing the legal restrictions around sports wagering in the United States puts even greater pressure on Canada to act on: “We’ve lost the opportunity to secure a competitive advantage on sports wagering by being the first mover in North America. Now unfortunately we are in a position where we must move to ensure we do not lose market share in the gaming space. Additionally, we have already become a more attractive destination for organized crime given the current government’s position as compared against the tangible legalization route being actively pursued in the United States.” Masse added. In 2015 Masse introduced his Private Member’s Bill “The Safe and Regulated Sports Wagering Act” the Bill was narrowly defeated with the strongest opposition coming from the Prime Minister and his Cabinet.